Smartphones nowadays are pretty awesome — they are so powerful that the words “consolde-grade graphics” get thrown out a lot. Obviously, we can't run games like The Witcher 3 or Star Wars: Battlefront 2 on them just yet (despite the fact that the latter's monetization system is obviously made for mobile), but it's pretty often that we see console or PC games get ported for phones and tablets. 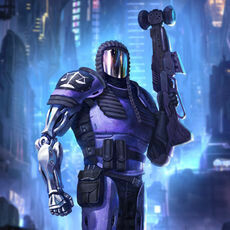 Such is our newest entry — Jydge. A top-down, twin stick, rogue-like shooter with RPG elements. If that sounded like a mouthful, let us shorten it for you — you dodge a ton of bullets and shoot at a ton of guys. There are also explosions. Jydge has thus far been available for PC, PS4, Xbox One, and Nintendo Switch, but has now made the jump to iOS, taking its looks, features, and crazy action with it. As you may have guessed by the game's name, it's obviously drawn some inspiration from the popular comic Judge Dredd. By inspiration, we mean you play as a supercop in a dystopian future city who is tasked with keeping civilians safe and passing judgment to the local crime gangs — usually in packages of lead bullets, electroshocks, and bazooka rockets. Depending on how well you do on the missions, you get some money to spend on your tools. There are quite a lot of gear options to choose from and part of the appeal of the game is to “customize your own Jydge”. The game costs $4.99 on the App Store and we'd say it's a pretty decent shooter.